Habit: Shrub, tree, armed with prickles, stipular spines 0. Leaf: even-2-pinnate, generally alternate, generally deciduous; petiole, main axis generally with raised glands. Inflorescence: [head] spike, generally 1 (rarely in raceme, panicle). Flower: radial; sepals, petals 4--5, inconspicuous; stamens many, conspicuous, exserted, free; ovary simple. Fruit: generally dehiscent, generally flat. Seed: aril generally 0. Species In Genus: +- 200 species: tropics, subtropical America, Africa, Asia, Australia. Habit: Shrub, < 7 m, +- hairy. Stem: twigs +- ridged; prickles recurved. Leaf: clustered on short-shoots or not, < 2.5 cm; petiole 2--10 mm, +- hairy; 1° leaflets 1--3 pairs, 7--16 mm; 2° leaflets 3--6 pairs, 2.8--6.3 mm, 0.6--2.5 mm wide, oblong to obovate, +- hairy. Inflorescence: >= 1 clustered with leaves on short-shoots, stalked, 1--4 cm, generally > leaf. Flower: light yellow to cream. Fruit: 5--15 cm, 10--25 mm wide, curved or twisted, papery, light brown, glabrous. 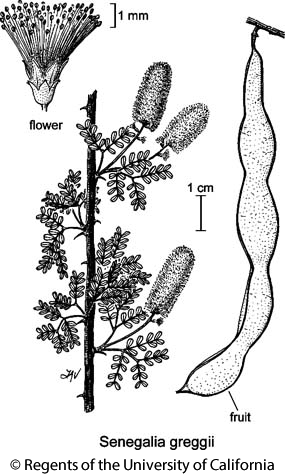 Citation for this treatment: David Seigler & John E. Ebinger 2012, Senegalia greggii, in Jepson Flora Project (eds.) Jepson eFlora, http://ucjeps.berkeley.edu/eflora/eflora_display.php?tid=89126, accessed on April 20, 2019.
e PR, D; Markers link to CCH specimen records. Yellow markers indicate records that may provide evidence for eFlora range revision or may have georeferencing or identification issues. Purple markers indicate specimens collected from a garden, greenhouse, or other non-wild location.